Ever wonder what possesses randonnerds to pedal miles on end through long days and nights? Mesmerized by our classically styled steel bikes, wool jerseys and flashy neon hi-vis clothing? Then you should check out a populaire to learn more about this crazy sport. It’s a great way to dip your toes into long-distance riding with its (relatively short) introductory distance of 115k (71 miles). 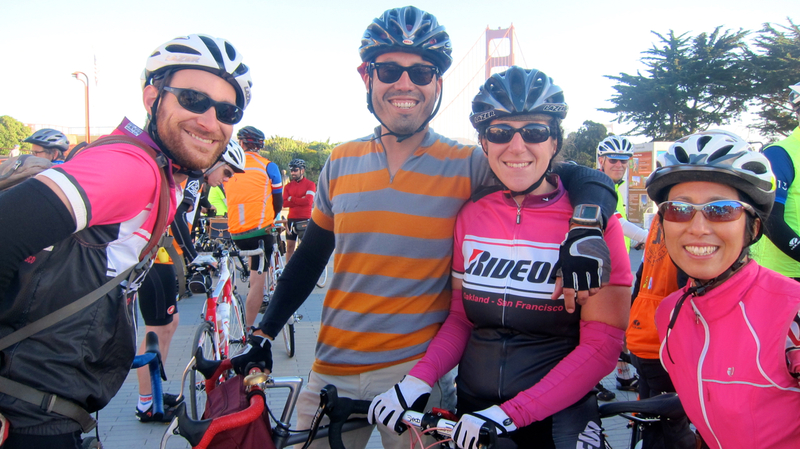 The San Francisco Randonneurs held its Populaire today on the second official day of summer. It was a beautiful morning and I have to admit, it was wonderful starting a ride in daylight for a change (we’re normally bleary-eyed at registration in the dim hours before sunrise.) Our Regional Brevet Administrator, Rob Hawks, graciously allowed several of my Ride-On crew to sign up at the last minute; Chava, Jorge, May and Nick joined me for our loop through Marin via Pt. Reyes Station and Nicasio. Chava and Jorge were on my “Rand-On” Dart team several weekends ago; the blistering heat and time mismanagement were our greatest enemies that day — so we sadly DNF’ed. But this time around, we were blessed with perfect weather, kept a careful eye on our watches and cooked with gas on the road as a group — and thus finished our ride in just over 6 hours. Highlights of the day included a tasty goat cheese croissant from Bovine Bakery, riding and chatting with other randonnerds along the way and stopping for affogatos at Cibo in Sausalito. Then we unwound at Crissy Field’s East Beach for a delicious post-ride feast prepared by Kimber and Julia. Thanks to Andrew and Henrik for giving me a lift to the city in the morning, and of course this fantastic day wouldn’t have been possible without all of the hard work put in by SFR volunteers. Chapeau!